The Appenines region of central Italy has been struck by a deadly earthquake, with a magnitude of 6.2. The quake, which had an epicentre roughly 10km southeast of Norcia, Italy, occurred just over seven years after the 2009 L’Aquila earthquake that killed more than 300 people only 90km away. The latest earthquake occurred at 3:36 am local time. The number of fatalities is unknown at time of writing but already exceeds 30. Buildings have collapsed in nearby Amatrice and residents are reportedly trapped in rubble. 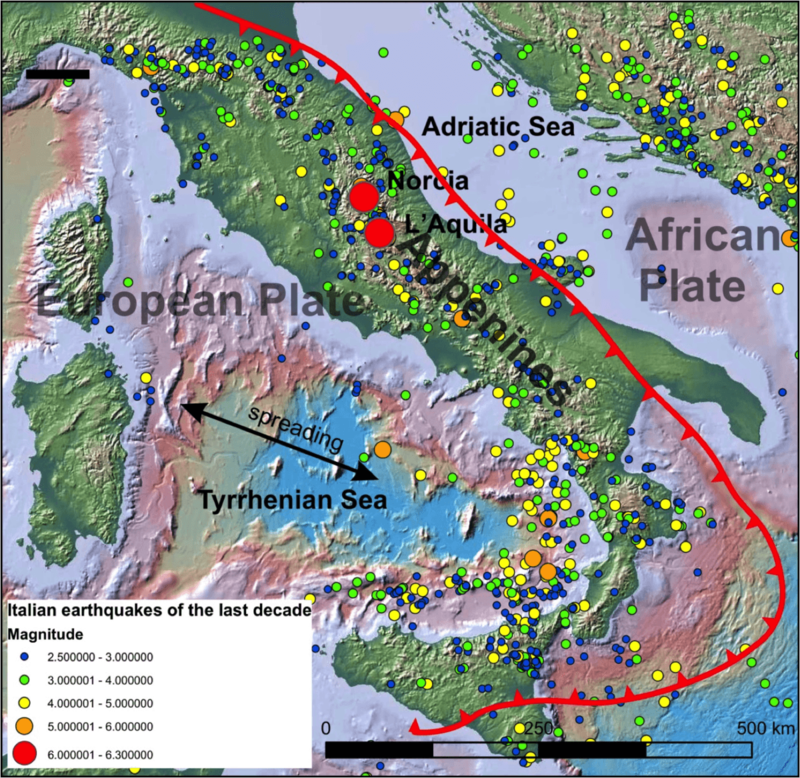 General tectonic setting of Italy, showing seismicity over the past 10 years from the USGS catalogue. Following the L’Aquila earthquake, six scientists were convicted of manslaughter for failing to inform the public adequately of the earthquake risk. Although the charges were subsequently dropped, this marked a major development in the way blame is apportioned after large natural events, particularly with regard to effective hazard communication.